The news yesterday was stupefying for Chicago aficionados of “encased meats” and those who enjoy long waits to get something to eat: Hot Doug’s, the so-called “sausage superstore,” will serve its last dog this fall. A collective wail spread through the food-loving community, a demographic that never ceases to amaze me with their quest for edible products that are unabashedly hip, generally expensive and usually requiring a lengthy wait to purchase. This aptly-named Chicago online source even reports on the “reaction” by Chicago’s food community to the closing on what basically is an upscale hot dog stand. But back to the purpose of this post: Hot Doug’s is located in Avondale, and fortunately, media reports on the story — from both traditional and digital outlets — identify the establishment as being in Avondale. It’s where I’ve lived the past 14 years, a neighborhood often overshadowed by its sister neighborhood to the south, Logan Square. Avondale is what Brooklyn is to Manhattan, what St. Paul is to Minneapolis: Grittier, edgier and perhaps to some, less cultured and less expensive. 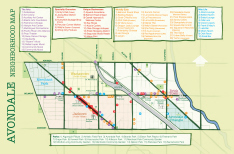 Many never heard of Avondale, or just lumped the neighborhood in with its wealthier neighbor. But perceptions — like real estate values — change over time, and Avondale is now hip. Read this Chicago Sun-Times piece for details. Not to knock Logan Square: Susan and I lived in a wonderful apartment in a greystone on Logan Boulevard for eight years and were very content. But it wasn’t ours, and when time came to purchase, we found a wonderful home in Avondale — just a block north of the formal boundary between the two neighborhoods. 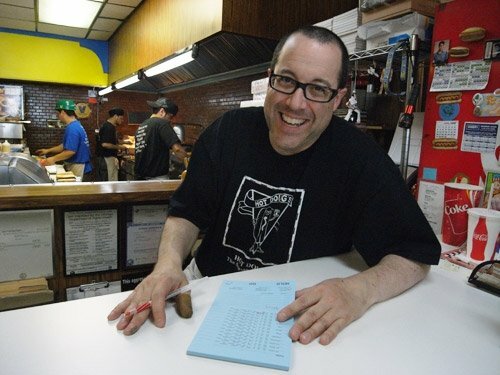 In fact, we’ve been in our Avondale home a little longer than owner Doug Sohn has held down counter duties as Hot Doug’s. So, we were pioneers of living in a neighborhood on the cusp of cool even before Mr. Sohn. So, thanks Mr. Sohn for helping to build awareness for Avondale as the next bastion of hipness. But remember, we were here first. According to this post from Fluid Drive Media, we received between 3,000 to 20,000 messages each day. And, this report from CBS, the average American is exposed to up to 5,000 ad message daily. There’s other statistics like this, I’m sure. But rest assured, we are bombarded by messages, especially when we go on line and open a browser window. For the record, The PRDUde does not take advertising dollars; but I might mention you in a future post if you buy me a good beer. On to the focus of this post. 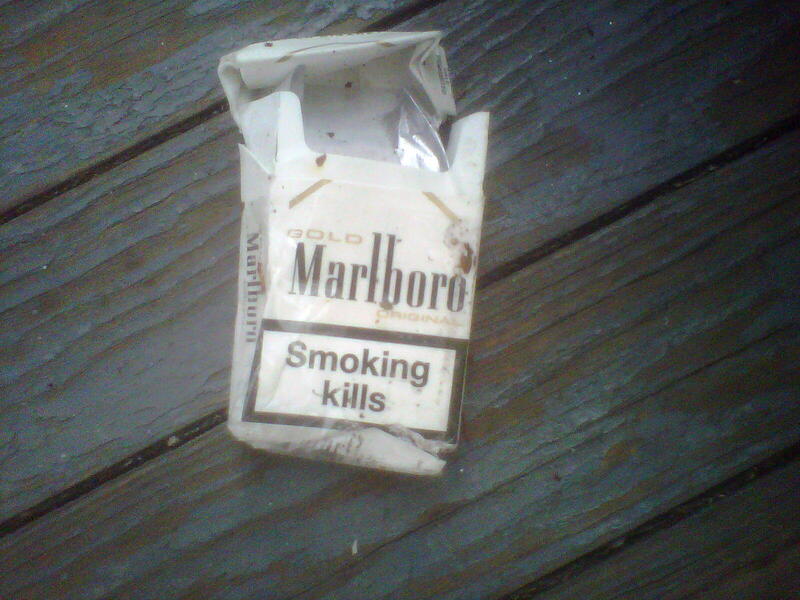 Today, I found a crumpled, empty pack of Marlboro Gold on the sidewalk in front of our home. It contained a warning message that’s pretty straightforward, as you can see from the adjacent image. Most educated people are aware of the dangers of smoking, but they continue to puff away. Some discard their empty packs and spent butts with reckless abandon, ending up on someone’s lawn. The warning message on this Marlboro package, in boldface type and right below the brand “logo,” is the result of federal laws that took effect last year. The objective of this message is to decrease the number of smokers in the U.S.
Now look at the image to the right. This graffiti, probably sprayed on by gang punks or wannabe gang punks last night, now adorns a building right across from our home in the Avondale section of Chicago. What does this nonsense mean? I have no idea, however it’s a criminal act. I trust it’s a “warning” message of some kind to alert rivals that our block is turf claimed by some affiliation of punks who believe they “own” or “control” the neighborhood. For the record, we did have gang activity around our home years ago; it’s gone, thanks to more concerned neighbors and regular police patrols. 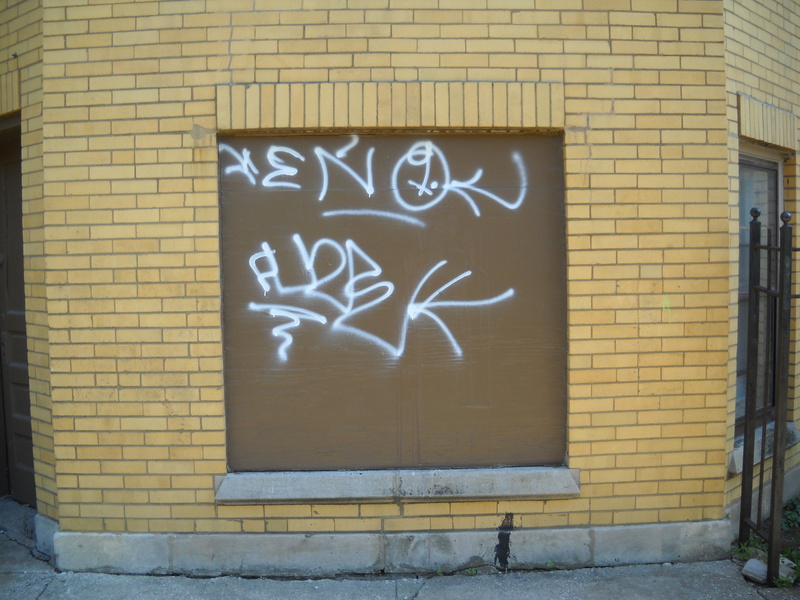 And, I called the City of Chicago to request the graffiti be removed. Before drafting this post, I checked my email accounts, visited Facebook, watched a news program on TV and read parts of the Sunday Chicago Tribune. I received lots of messages. But it was two very simple, non-digital messages — the cigarette pack warning and gang graffiti — that prompted me to act. What messages grabbed your attention today? 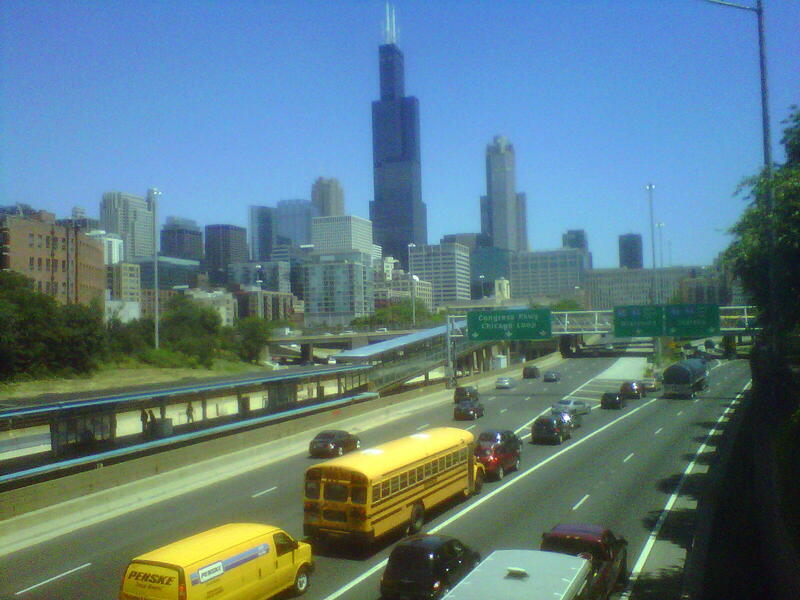 This summer has been delightful here in Chicago, especially from a weather perspective. That makes for ideal conditions to take advantage of all things relaxing and outdoors. These past few weeks, I’ve started my day on the front porch, lounging on the wicker furniture Susan restored. I leisurely enjoy my coffee and can read as many articles as I want from the Chicago Tribune, which we still have delivered. Here’s a street in Avondale. It’s not the street I live on, but it’s representative of our neighborhood. I’m accompanied by birds — cardinals, robins and sparrows — and am serenaded by their calls. The morning sun, filtered by the linden trees to the east, is warm and inviting. From our front porch, I greet neighbors — retired folks like Joanne, long-standing friends like Bree, Hispanic kids, hipsters sporting tattoos and straw fedoras — heading to work, off to school or walking their dogs. In essence, I see the neighborhood come alive; it’s peaceful and tranquil, and a reflection of how Avondale has evolved from one sometimes plagued by gang punks, loud cars and graffiti to one of tolerance, quiet and normalcy. This is the view from outside the office building where I now work. Can you guess where it is? Well, my cherished morning routine is over. Now, I’ve joined my neighbors. I now have someplace to go. I landed a new full-time position. Always remember you have value in today’s job market. And, as for my coffee-and-newspaper routine: There’s still Saturday and Sunday, and there’s half of summer left. Well, the sun also rose today, the start of the third month since I became unemployed. And, winter made a debut, leaving the first few flakes of snow. But perhaps “unemployed” is not at all the right word. Since being let go from my former full-time position in public relations, my days are a whirlwind of activity: Networking initiatives; responses to posted jobs; calls, emails and research into places I’d like to work at; more project work than I imagined; volunteer work on behalf of the Universal Accreditation Board and the Chicago Chapter of the Public Relations Society of America; learning more about the increased role of Web 2.0 in public relations and business; meetings and more meetings. Oh yes. 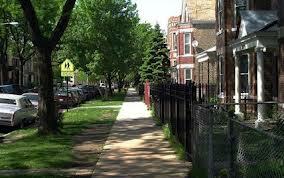 I still take my morning walk, usually after 9 a.m. when the streets in our Chicago neighborhood are quiet. Those with “real” jobs are at work, leaving the thoroughfares of Avondale and Logan Square to me, a few joggers and others out for a stroll. There’s a certain tranquility in mid morning on these streets, framed by century-old stone and frame homes, some quite grand and stately. Newer parts of the city can’t match the sense of permanence we have here. Generations ago, this part of Chicago was built up by developers who sold two-flats and single-family homes primarily to European immigrants. They stayed for decades, raising families and building futures. Most moved away in the 1960s and 1970s; but their presence will forever be defined by what’s left, the streets where I walk each morning. It’s late now. I look forward to waking up some seven hours from now to a new day filled with challenges and activity, another day searching for an opportunity where I can contribute my skills in public relations, another day of being “unemployed.” And, another day to walk the streets I have all to myself.